Marking the next generation of sophisticated controls, the Vent-Axia PureAir Sense is delivered factory set for continuous operation at low speed, with the fan featuring an adjustable timer that can be triggered via a switch live or light sensor. This intuitive light sensor recognises room occupancy through light movement and shadows, but can distinguish between car headlights flashes and people moving about to avoid nuisance running. A delay-on feature can also be set to avoid the fan being triggered in the night during quick bathroom visits. The light sensor also acts as an overrun timer, without having to be controlled through the light switch. This means in houses where there was only a basic fan before, the homeowner can upgrade to a timer fan without having to rewire. Leading the way in ventilation, the Vent-Axia PureAir Sense introduces an intelligent, fully automatic humidistat for moisture control. This means the fan learns to run only when it can make a difference to IAQ. Continually monitoring and recording the moisture content the PureAir Sense maps the humidity profile throughout the year. This process enables the fan to run only when it can lower the moisture content in the air, reducing nuisance running and helping ensure a healthy environment. For electricians the Vent-Axia PureAir Sense offers ease of install with the fan delivered with factory settings that will be perfect for the majority of projects. This means the fan install only involves fitting and there is no need for set up, saving time on site. If a customer does require customisation, the fan’s features can easily be altered via a user-friendly touch panel or a downloadable app on a smart phone. And, coming with a 7-year guarantee, electricians really can fit and forget the PureAir Sense confident that this premium fan will have fewer callbacks. Plus, further adding to install flexibility the PureAir Sense offers a powerful airflow of up to 39l/s which means it can cope with long ducts and bends up to 2m without compromising on ventilation. Featuring multiple speed and boost modes, the Vent-Axia PureAir Sense has a default speed set for trickle continuous flow at 10l/s. The light sensor triggers the timer function to run at 15l/s for 15mins. Both the odour and humidistat functions boost at a higher 28l/s to react quickly to remove humidity or odour from the room. The Airing function runs for an hour at 15l/s to rid the room of stale air, if the fan has been inactive for 26hrs. For households this means no more worries about stuffy, musty odours in the bathroom when they return from holiday. Meanwhile, the fan will also prove popular with customers thanks to its quiet running, operating as low as 19 dB(A) on low trickle, and low power consumption of only 2-5W. With the Clean Air Strategy launched in January the Government published its aims to tackle all sources of air pollution, to make our air healthier to breathe. IAQ is a key part of this with the strategy proposing a number of simple measures to reduce air pollutants in the home, including regular ventilation. The document suggests a number of practical ways to reduce indoor air pollution from VOCs including non-methane volatile organic compounds (NMVOCs). These include switching to lower VOC alternatives, such as unperfumed cleaning products and recommends ensuring homes are well ventilated to avoid the accumulation of emissions from multiple sources. With IAQ now a high priority the Vent-Axia PureAir Sense, as the UK’s only bathroom fan with an odour sensor, will help offer peace of mind to households. Boasting over 80 years’ experience, Vent-Axia is the ventilation sector’s clear leader, chief innovator and forerunner in energy-saving, lo-carbon products. Committed to helping improve indoor air quality and comfort in both homes and buildings, Vent-Axia provides the sector’s most comprehensive choice from any single manufacturer. 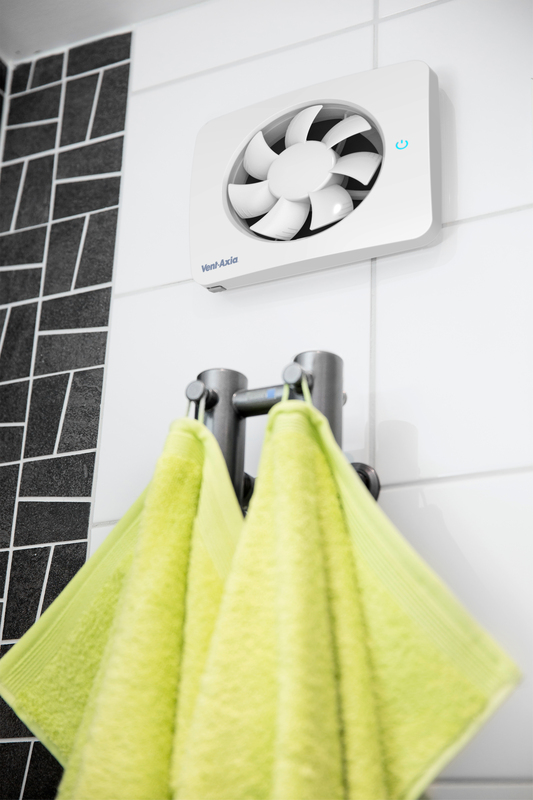 Vent-Axia’s range covers not just air movement and ventilation technologies but heat recovery, electric heating, hand dryers, cooling and clean-air systems for residential, commercial, public sector and industrial applications. This press release was distributed by ResponseSource Press Release Wire on behalf of MacLean Communications in the following categories: Home & Garden, Consumer Technology, Construction & Property, for more information visit https://pressreleasewire.responsesource.com/about.